For Memorial Day we had a Crusader Reunion at Adam Sidwell's house. Maxine pulled out all the stops and made three amazing pies - banana cream, coconut (with lime whipped cream) and a cherry pie made with fresh cherries. Each pie was pretty much perfect. She also used two different kinds of crust for the pies. Because she's an overachiever like that. Ellie wanted to dress up so she donned her ladybug costume, cape, Captain America shield, and pirate sword. She was pretty much ready to take on the world. Yesterday Ellie got to go to her first ever birthday party for a friend! She had a blast after her initial warming up period. She also got her very first sunburn from being outside in this cute dress. The boys also went to our neighbor's superhero party but we didn't take any pictures. Silly us. On Friday we had our monthly team-building exercises. One night a couple co-workers were drunk and bored and decided to build a water bottle rocket launch pad and hooked it up to an air compressor. That pretty much decided our activity. 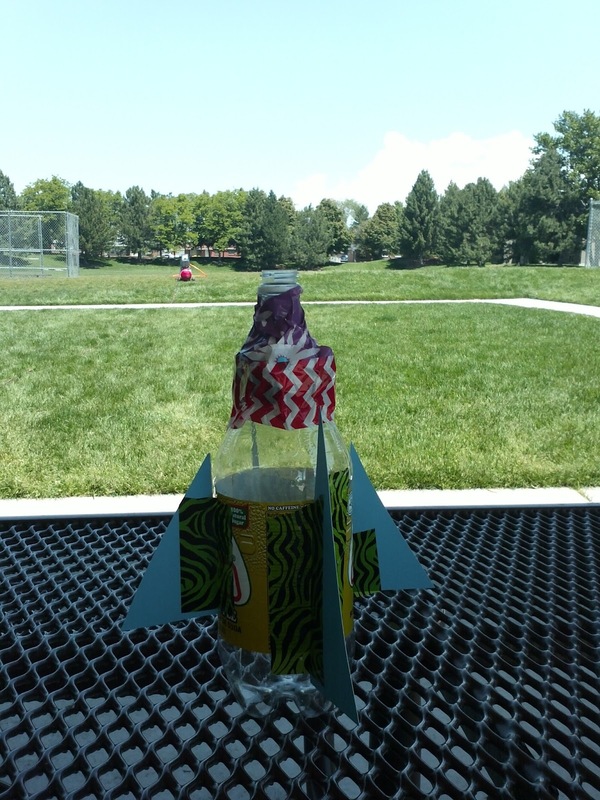 This is my pathetic excuse for a rocket. Some of them were pretty involved. Maxine sold this amazing cake for her bakery yesterday. This week was actually pretty busy but we didn't take a lot of pictures. We spontaneously decided to watch Star Wars this week so on Wednesday we watched "A New Hope" and on Thursday we watched "Empire Strikes Back" although the boys really just wanted to watch the battle scene on Hoth. Holy cow they love that scene. They play it over and over on Lego Star Wars. Sammy actually bought a miniature Lego AT-AT with his birthday money. On Thursday the kids went to the dentist for the first time in years. Isaac had no cavities and he still hasn't lost any teeth although a few weeks ago his teeth collided with a schoolmate's head and they're very dark and bruised but not loose or anything. Sammy has two potential cavities forming so we've got him on a flossing regimen each night. Also Thursday was the first warm day we'd had in a while (SO MUCH RAIN LATELY!) and we decided to go swimming at the Lehi public pool. The kids of course had a wonderful time and Isaac is getting really good at swimming. On Friday we went to the brand new Lehi hospital open house and gorged ourselves on free hot dogs and ice cream. We did a tour of the maternity ward where Maxine will give birth and the rooms are huge! Yesterday Grandma Coco came to visit and we went out to Viet Deli for Vietnamese food and stayed up past midnight watching "Brooklyn Nine-Nine". We had a blast. Today was super hot so we broke out the water guns and let the kids go crazy in the backyard. I can't believe I didn't take any pictures! But it was a really nice day. It was in the upper 80s/low 90s and was our first truly hot day of the year.